Sadly, children are often the first hurt by alcohol and drug addiction and the last helped. Children of alcoholics are four to nine times more likely to develop an addiction as a direct result of their family experience. Left untreated, these kids are more likely to suffer from depression and other mental health issues as teenagers and adults. Happily, a safe healing community exists for kids and parents. Designed by one of the world’s leading experts on kids and addiction, Dr. Robert Ackerman, Renascent’s Children’s Program helps kids aged 7 to 13 come to terms with the impact addiction has had in their lives. Over the course of the program, kids learn that it’s okay to hate the disease but love their parents. They learn practical tools to support self-care, communication, and the expression of emotions that may have been stifled. They learn that they’re not alone and that other kids and families share their experience. The treatment program is powerful, yet allows kids to be kids. Play, arts, and games help kids process addiction and recovery as a personal and family experience and in an age-appropriate way. Renascent’s Children’s Program is open to children aged 7 to 13 who’ve been impacted by another family member’s problem with alcohol and/or drugs. All children are welcome, whether their family member is currently using or not. At least one parent or person playing a key caregiving role must accompany the child; adults must be clean and sober to participate in the program. While kids are working with their peers and children’s counsellors in one room, parents and caregivers are given the opportunity to connect with other parents. 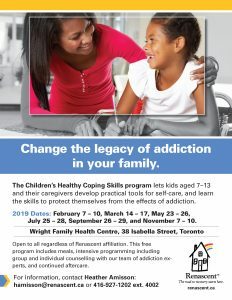 Through counselling and peer support, parents can discover how to honour their own recovery from drug and alcohol addiction while learning how to parent in ways that boost the resilience of their children and their family as a whole. Renascent provides a structured aftercare program so children can stay connected with their counsellors and peers in recovery. Renascent offers two youth support groups – one for younger kids and one for teenagers. Give us a call toll-free at 1-866-232-1212 and talk to one of our family counsellors. All consultations are free and confidential.